These instructions are valid both for legally buying a gun, and for getting a handgun license. 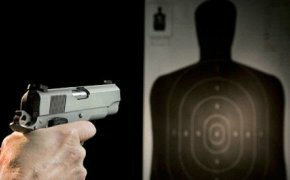 NOTE: in order to get the handgun license, you have to already know how to load and shoot a pistol, and be prepared to take a shooting Proficiency test to prove it. If you do not know how to shoot, register for "Learn to Shoot" first. Apply to the state for a Texas Driver's License. Go to any store that sells hunting licenses, and buy the one-year "General License". Apply to DPS for the License To Carry, and schedule fingerprinting. Register for the required training class (LTC class). LTC-100 Certificate of Training (suplied by us). A copy of the visa page in your passport. A copy of your I-94 form, received when you arrived in the U.S.
A copy of your Hunter's License. Submit all documents to DPS by mail or upload, and wait. It takes several weeks.